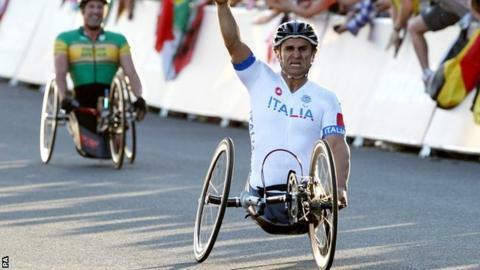 Italy's Alex Zanardi won his second Paralympic gold of the London Games with victory in the handcycling road race at Brands Hatch. The ex-Formula 1 driver, who lost both legs following a crash in 2001, won the H4 handcycling time trial on Wednesday. And the 45-year-old followed it up with a sprint finish to take the road race ahead of South Africa's Ernst van Dyk and Belgian Wim Decleir. Zanardi had both legs amputated following a Cart accident in Germany. "To win this race in this way, in such a dramatic way and sprinting makes me really proud," Zanardi said. "It shows that I am a complete cyclist, even if I have no legs. "The race did not go as I expected. I thought that I could take off soon and that I would only need to stay calm, but at the fourth lap I tested my opponents and understood my tactic would not work, so I changed it completely and only tried to save, save and save. Last year Zanardi won the New York marathon at the fourth attempt and also claimed world time trial silver.